Jammu, March 04 - Stating that tourism holds excellent prospects for increasing the income levels of the people of the State, the Minister for Tourism and Culture, Mr. Nawang Rigzin Jora said to give a major lift to tourism industry in the State, the Government has created Tourism Development Authorities of the famous tourist resorts across the state. This was stated by the Minister while reviewing the pace of various works being executed under Verinag Tourism Development Authority (VTDA) here today. The Minister said Verinag, the gateway to the elysian vale of Kashmir, needs to be showcased as the prime tourists destination. He said that the place boasts of a rich historical background as a leisure retreat of the Mughal emperors who had not only glorified the place but, made a splendid garden with a stream passing through the middle of it. 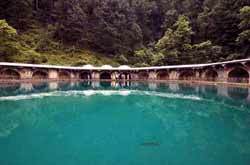 Mr. Jora said Verinag is also main source of River Jehlum the life line of Kashmir Region and needs to be developed for the Kashmir lovers who want to get the first hand feel of this magical place. MLA, Dooru Mr. Ghulam Ahmad Mir, Secretary Tourism Mrs. Tanvir Jahan, Chief Executive Officer, Verinag Tourism Development Authority and Deputy Director, Planning Tourism Department were among others who attended the meeting. During the meeting, threadbare discussion were held to address the impediments and bottle necks in the speedy completion of various works undertaken by the Authority. The Minister was apprised that the Authority has taken up several prestigious projects like construction of cafeteria at Verinag, development of Rasool Mir Park, facelift work of Look Bhawan Temple, development of Kulam Chinar as picnic site, development of Vethasta and development of Mughal Sarai at Omah which would be completed within stipulated time frame. The meeting was informed that execution of TRC, budgeted accommodation, hutments, clubs, development of parking lots, construction of bus stand and viewpoints would be taken up after completion of all codal formalities. The Minister was also informed that the Authority is going to develop a land bank of 581 kanals to create the tourism infrastructure at Verinag and other places under the Authority. So far, land compensation for 132 kanals have been deposited with concerned Collector Land Acquisition and Rs. 64.96 lakh have been paid as compensation for land acquired for construction of bus stand and office complex of the Authority to the land owners. The Minister said that the main objective for creation of Tourism Development Authorities in the State is to preserve the beauty of nature and create tourism infrastructure in consonance with the local resources and needs. He stressed upon the concerned authorities to redouble their efforts and work with devotion and dedication for ensuring time bound completion of all development works being executed under various Tourism Development Authorities.